Yesterday I woke up to sub-freezing temperatures and a sky spitting snow. By the evening, I was in 70-plus degree weather and gusts of winds. In other words: I flew from Minnesota to Missouri. And while I was bundled up for warmth up north, by the time I got home, I had totally re-acclimated to warm weather. Like a duck to water! Like a moth to flame! So I am sooo ready for summer. And along with this ridiculously warm weather, we need some tasty tropical flavors in our food. Bonus for extra-lazy preparation, to allow more enjoyment of the warm weather. If that sounds like what you’re craving nowadays (with apologies to those in the north who still have snow on the ground) – I’ve got the perfect recipe for you. It all started with a recent obsession of mine: Trader Joe’s simmer sauces. 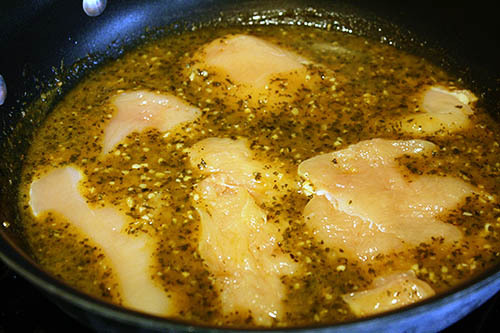 The idea is that you cut up your chicken, dump it in a saucepan with this sauce, bring to a simmer, and in a matter of minutes you’ve got a delicious dish that’s perfect over rice. I was checking what other simmer sauces are available when I read many laments over a discontinued products: Cuban Mojito simmer sauce. Apparently it was delicious? Fortunately, this smart lady figured out the recipe and posted a copycat version. I happened to have an extra cup of orange juice languishing in my fridge (Mr. P and I don’t really care for straight OJ), and this seemed like a super easy dish to try and use it up. 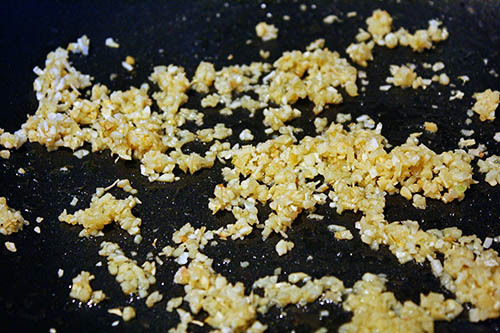 First I added minced garlic and dehydrated mined onion to a pan and sautéed it around a bit in olive oil (over medium heat – don’t let the garlic burn!). The original recipe uses freshly diced garlic and onions, but it requires an immersion blender. I took the pre-minced shortcut route and found an immersion blender (or food processor) isn’t necessary. The original recipe called for flour at this point to make a roux, but because I skimped a bit on the oil and used dehydrated onions, there wasn’t a lot of liquid or fat to work with. 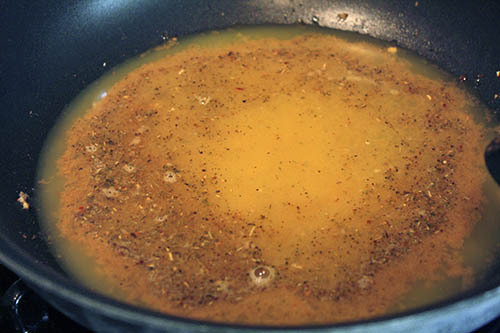 Instead I went straight to adding the other liquids: a quarter-cup each of apple cider vinegar and lime juice, and a cup of orange juice, plus one and a half tablespoons of cumin (SO MUCH CUMIN) and a teaspoon of Italian seasoning... because I don’t keep oregano. All the acidity kind of freaked me out, but I figured the sugar in the orange juice – plus the added sugar below – would help balance it out. 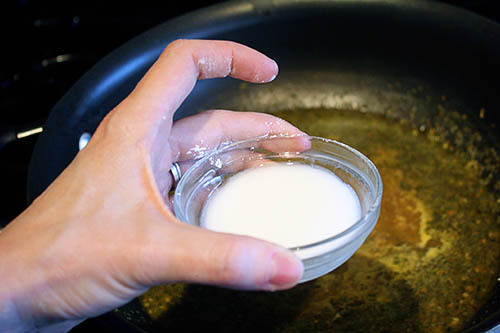 Dissolve the cornstarch in the little bowl (the extra water won’t hurt in the end, promise), turn the heat down, and then pour it in and stir. Perfectly thickened sauces without lumps every time! If you use flour as instructed in the original recipe, this step is unnecessary, of course. 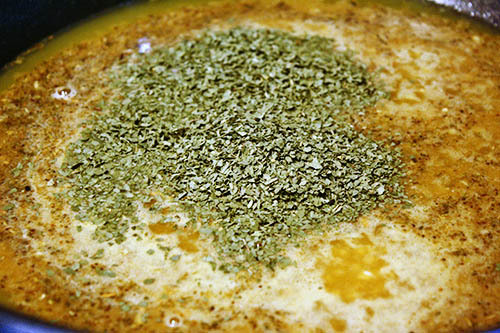 Okay, leave that uncovered (I made the mistake of covering it) and set it on simmer – we’re almost done. 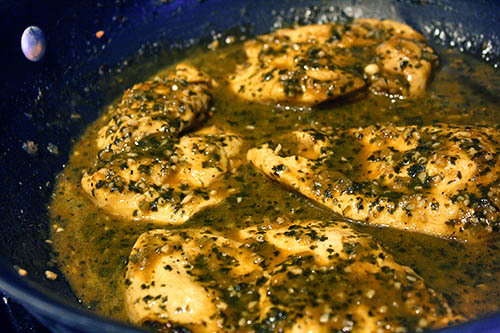 There’s just one thing missing from our mojito chicken, and that’s.... can you guess? Yes. Chicken. You guys are amazing. 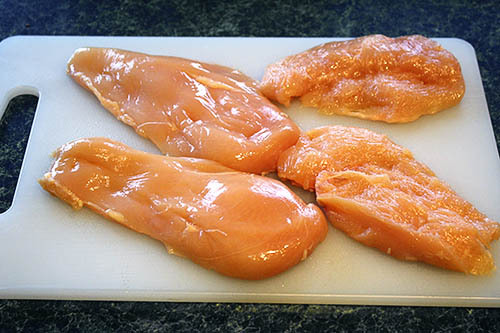 I used my old trick of cutting chicken breasts in half lengthwise for this dish. I don’t always do it perfectly, so there’s usually a wonky-looking half, but it definitely cooks more quickly that way and yields a more reasonable portion size. Then I turned the heat back up to medium, added the chicken right in, and covered it back up. When I heard it bubbling, I turned it back down to medium-low. No pre-browning! I mean, you could. Or you could do it this way and walk away! In the meantime, you could start cooking green beans and rice, or have a glass of wine, or... write a blog post. Or all of the above! After about six minutes, I gave them a flip and let them simmer on the other side. I did cover them at first, but then I wasn’t liberating enough liquid from the sauce. So, I had to remove the chicken (lest it become overdone) and cook down the sauce separately. Hopefully if you leave the lid off the whole time, it will help! Knockoff Trader Joe’s Cuban mojito chicken! Yes sirree! I have no idea if it tastes like the original, but it was tasty by itself! Now. Mr. P and I both liked this well enough (though he tactfully told me he preferred lemon flavors over orange) – but it would have been better if you followed the dang instructions. See, I wanted to use up the whole cup of orange juice left in my fridge, even though the source only called for three-quarters of a cup. Result: too orangey. Take it from me; don’t try to use a whole cup. Just pour that extra quarter-cup down the drain. Shh, I won’t tell. Still, while this was yummy with flavors particularly well-suited to warm weather, it wasn’t our favorite dish such that I’d buy orange juice especially to make it. But if I have extra orange juice to use up, sure! And if you normally keep orange juice on hand, I bet you’d really like it. And you might as well try it, as it’s so super easy! Almost as easy as cracking open a jar from Trader Joe’s. Enjoy! Which Trader Joes simmer sauces do you usually buy and enjoy? 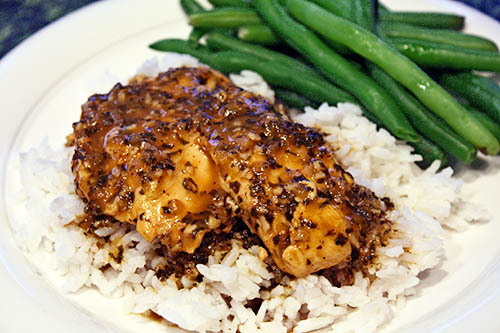 I'm always looking for fast and easy weeknight dinners, and my husband loves anything served over rice. @Rachel - so far we've only had the Masala (2x), but I've got the Curry in my pantry to try this week. I think there's also a Korma? They all seem to be Indian-inspired flavors, currently. I was hoping for a bit more variety, but it's still easier and cheaper than making a curry from scratch!